Gates open 9 a.m. – 3 p.m. Kids 11 and under FREE admission. 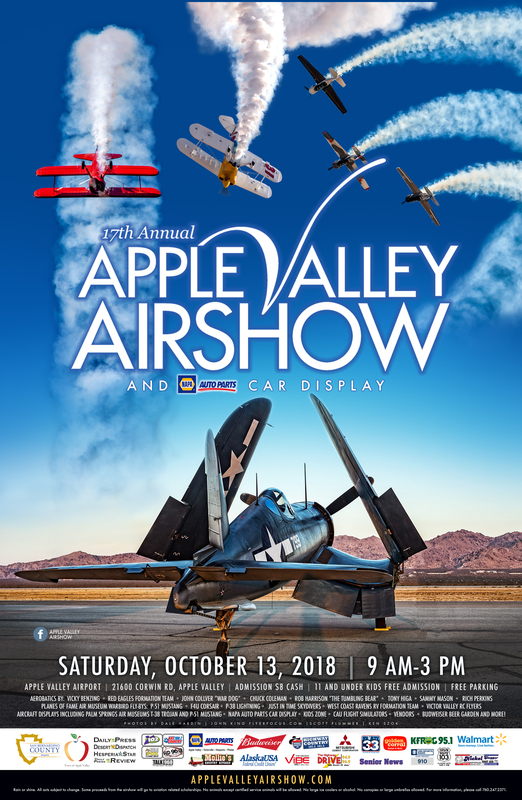 Aerobatic performances, Planes of Fame Warbird Fly-bys, Skydivers, Formation Flying Team, USAF F-16 Viper Demo Team Heritage Flight, Static Displays, Car Displays, Kids Area, Food Vendors, Vendors and lots more! Bring chairs, blankets, hats, sunscreen, sunglasses. No animals except for ADA Compliant Certified Service Animals will be allowed. No large umbrellas, or canopies, large ice chests or alcohol allowed. Copyright © 2019 Apple Valley Airshow.